Côr Meibion Pontypridd is a Welsh male voice choir from the Pontypridd area of the Rhondda Cynon Taf, Wales. 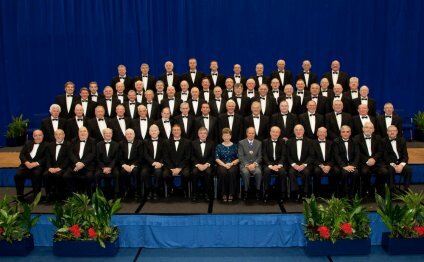 Côr Meibion Pontypridd (Pontypridd Male Choir; the name means Choir of the Sons of Pontypridd) was formed in 1949 for traditional Welsh singing. The choir performs frequently both in Pontypridd and overseas, and has visited Poland, Ireland, the USA and Germany. Links have been forged with Liederkranz Oberensingen, a German male choir from Pontypridd's twin town, Nürtingen. The choir also performs regularly at the National Eisteddfod of Wales and takes part in the HTV male choral competition. The choir is currently broadening and improving its repertoire to provide a wide-ranging concert program. The choir is a member of the National Association of Choirs, the Welsh Association of Male Choirs and the Welsh Amateur Music Federation, and is a past winner of the HTV Male Choral Competition and at the National Eisteddfod of Wales. Cor Meibion Pontypridd was founded following a meeting of a small group of men at the Educational Settlement of the town’s Y.M.C.A. on 19 November 1949. During its early years the choir was known as the Pontypridd Educational Settlement Male Choir. Mr Gwilym T Jones, who at the time was a conductor and pianist, became its first conductor. He had previously conducted choirs including Cwmparc Male Voice Choir, Royal Welsh Male Choir and Treorchy and District Male Voice choir. In 1926, he began conducting for Pontypridd and District Male Voice Choir. Two years later he also began conducting for Llanharan Male Voice Choir. The choir’s first concert was a private one for the Cilfynydd Old Age Pensioners in the summer of 1950. In November of that year the choir performed in the Shelley Hall at their first annual concert. A month later the choir gave the first of its 14 consecutive Christmas night concerts at the old Graig Hospital. It became a tradition that the choir was entertained to Christmas cake and tea by the Hospital Administrator of that time. The concerts stopped with the reconstruction of the hospital in 1965. The first competition for the choir to enter was at a semi-national eisteddfod held at Llanharan on 23 June 1951. They were awarded first prize and there was a report concerning them in the Pontypridd Observer. By the time of the choir’s second annual concert in November 1951, they were known as the Pontypridd and District Y.M.C.A Male Voice Choir. They made their first BBC recording in June 1956. It featured in a programme about the centenary of the composing of Hen Wlad Fy Nhadau and the Bi-centenary of the building of the Old Bridge. A major concert was also held as part of the celebrations in the Town Hall. This was to be the last concert that Mr Gwilym T. Jones was to conduct. He died on 31 December 1956 and a plaque to his memory was unveiled in the Shelley Hall in September 1957. Following his death Mr William J. Evans, father of the opera singer Sir Geraint Evans, was appointed leader of the choir in January 1957. Previously, he had formed the Handel Glee Party in 1932 that won prizes at eisteddfodau. He had also formed the Cilfynydd Philharmonic Choir in 1950. Under his guidance, Pontypridd and District Y.M.C.A. Male Voice choir's performances attracted large audiences. The choir performed alongside Sir Harry Secombe and Sir Geraint Evans at the Town Hall Theatre, Pontypridd in November 1959. They won several first prizes at semi-national eisteddfodau. The following year the choir relinquished its connection with the YMCA and its title became the Pontypridd Male Choir. However, by the time William J Evans’ retired from the conductorship in January 1964 the choir was known as Cor Meibion Pontypridd. His successor was Miss Joyce Durston, the choir’s accompanist since 1957. She had led Cor Meibion Pontypridd during the period of Mr William Evans’ illness and had previously been the conductor of the Christie Singers, a choir of 24 girls. Cor Meibion Pontypridd won the semi national eisteddfod at Cardigan in May 1964, their first eisteddfod appearance under her conductorship. They went to Germany on their first foreign tour in September 1965 and gave a series of concerts in Nurtingen, the German twin town of Pontypridd. The following year, a male choir from Nurtingen visited Pontypridd. Tours continued to occur. During Cor Meibion Pontypridd’s early foreign tours, they received a request from West German Chancellor Kurt Georg Kiesinger in August 1968 to perform at his private palace in Bebenhausen Palace near Stuttgart. The performance was later shown on television.